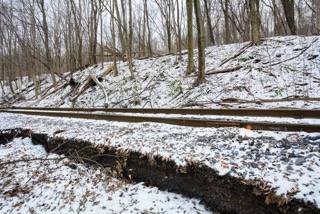 A landslide, believed to be mine related, has been discovered along the Western Maryland Scenic Railroad tracks between Frostburg and Switch #9. 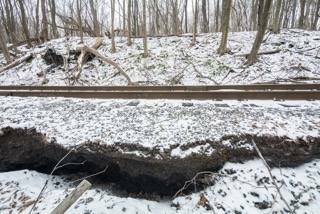 Until the track damage resulting from the landslide is repaired, the last two miles of WMSR’s typical route from Cumberland to Frostburg will be impassable. Train excursions will still depart from Cumberland, but will stop at Switch #9 before returning to the Cumberland station. WMSR will install the track required to allow for turnaround at Switch #9. Guests will be permitted to get off of the train at this location for a 30-minute layover while WMSR personnel prepare for the return trip. A schedule including the changes will soon be released. Repairs are expected to be completed by mid-summer. As a result of this landslide, WMSR has had to cancel its participation in the Shamrock Shuffle shuttling participants from Cumberland to Frostburg and back. The St. Patrick’s Day dinner scheduled for the same day, March 19, has been adjusted but is still scheduled. 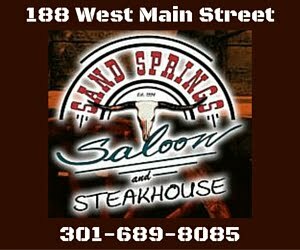 Rather than departing from Frostburg as originally planned, the excursion will depart from Cumberland to an overlook location while dinner is served. The Maryland Bureau of Mines is investigating the official cause of the landslide. For more information, please contact WMSR at 1-800-TRAIN50 or (301) 759-4400. See update and full article at the Cumberland Times News!